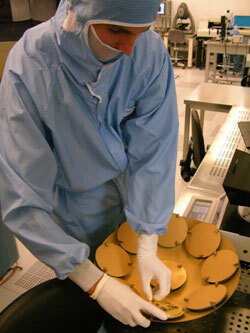 (Nanowerk News) Every year it produces over one million microchips and hi-tech electronic devices at the request of the Italian Space Agency for space research projects and of CERN in Geneva for major physics experiments as well as by private firms for the production of innovative solar panels, for the creation of sensors for environmental monitoring and for the improvement of industrial manufacturing. The so-called “Clean Room” of Fondazione Bruno Kessler in Povo (Trento), part of the Micro-Technologies Laboratory with a staff of 18 researchers and technicians, is expanding: on Tuesday, 4 May at 2.30 p.m. in the headquarters in via Sommarive, there will be the inauguration of a new area, a 200 m² sector in addition to the already operational 500. This innovation, made possible by the joint funding of the Autonomous Province of Trento, of the Italian Institute of Nuclear Physics (INFN) and of FBK, will lead to the more rational organization and the optimization of the laboratories’ processing procedures. The inauguration ceremony will be opened by the head of the Micro-Technologies Laboratory, Pierluigi Bellutti, who will introduce the speeches by Luciano Bosisio and Roberto Battiston of the INFN, followed by those of the President of FBK, Andrea Zanotti, of the President of INFN, Roberto Petronzio, and of the President of the Autonomous Province of Trento. The papers will be followed by a tour of the research and production laboratories and of the Clean Room. In detail, the paper by Roberto Battiston, professor of General Physics at the University of Perugia and member of the IRST Scientific Committee since 1995, will deal with the devices used in experiments in space, such as the MEMS (Micro-Electro-Mechanical Systems) also produced in the Clean Room in Trento and that next July will be sent onto the International Space Station. Luciano Bosisio, professor at the University of Trieste, will illustrate the European experiments being conducted at the CERN of Geneva (the world’s largest particle physics laboratory) that utilize the silicon devices also produced in the Clean Room. Indeed, in 2006, FBK researchers were awarded a prize by CERN for the best supply of microstrip detectors (hi-tech silicon devices) and computer-based instruments indispensable for the realization of ALICE (the acronym for “A Large Ion Collider Experiment”), one of the largest scientific experiments in the world dedicated to physics of matter and to the understanding of the origins of the universe.